Analysis: More often than not, Peterson has rid himself of a designation by week's end since dislocating his shoulder Week 5 in New Orleans. He did just that on his second opportunity to do so during preparations for the season finale. In his previous matchup Week 13 with the Eagles, he ripped off a 90-yard touchdown run but otherwise managed just one yard per carry on his other eight rushes. Peterson carried 26 times for 119 yards in Saturday's 25-16 loss to the Titans. He caught one of two targets for eight yards. Analysis: Peterson's third 100-yard game of the season pushed him over 1,000 rushing yards for the first time since 2015. The 33-year-old appeared to be losing gas over the last two weeks (29 rushes for 67 yards), but his big day on the ground proved that his renaissance year is not over yet. Peterson will look to put a bow on his strong Comeback Player of the Year bid in a matchup against the Eagles' 11th-ranked rush defense in Week 17. Peterson (shoulder) doesn't have a designation for Saturday's game at Tennessee. Analysis: Over the course of the previous 10 games -- the amount of time he's dealt with a lingering shoulder injury -- Peterson emerged from the week of prep with a designation a trio of times. After following an LP/LP/FP practice regimen this week, he'll keep that number at three. Peterson now can focus on a Week 16 matchup with the Titans, who have allowed 90.5 rushing yards per game to running backs this season. Peterson (shoulder) was a limited participant at Wednesday's practice. Analysis: Peterson has been nursing the same shoulder injury for most of the season without missing any games. His real concern is the state of Washington's injury-riddled offense heading into a Week 16 road game against the surging Tennessee defense. Peterson (shoulder) was listed as a limited participant on the Redskins' injury report Tuesday, Kareem Copeland of The Washington Post reports. Analysis: This has been Peterson's reality for more than two months due to a dislocated shoulder suffered in early October. With a short week to prepare for Saturday's game at Tennessee, the Redskins may cap his practice reps this week to keep him fresh, especially with the NFC East still up for grabs. No matter: He'll look to uphold his standard while playing with the injury, which has translated to 17.2 touches for 74.5 yards from scrimmage per game to go with five touchdowns in 10 appearances. Peterson rushed 19 times for 51 yards and caught two of three targets for 20 yards in Sunday's 16-13 win over Jacksonville. Analysis: Peterson got plenty of touches, but he didn't find much running room with the Jaguars focusing on stopping the run and daring fourth-string quarterback Josh Johnson to beat them. Expect a similarly large workload against crowded fronts for Peterson against the Titans in Week 16. Peterson (shoulder) doesn't have an injury designation for Sunday's game at Jacksonville, John Keim of ESPN.com reports. Analysis: Per usual, Peterson had his reps scaled back at practice but was never in danger of missing the game. It's a safe bet the Redskins will try to lean on their rushing attack in Sunday's matchup with a Jacksonville team that was humiliated by Derrick Henry last week. Of course, the injury-riddled Washington O-line may have some trouble opening holes without giving the Jaguars defense any reason to respect the pass. Peterson (shoulder) was a limited participant at Thursday's practice, Daniel Popper of The Athletic reports. Peterson (shoulder) practiced on a limited basis Wednesday, Kareem Copeland of The Washington Post reports. Analysis: Peterson typically has had his practice reps capped to some degree in the first practice of each week since dislocating his shoulder on Oct. 8, only to ditch the designation before gameday. Expect him to follow that path again as the Redskins prepare for a Week 15 matchup with a Jaguars defense that ranks 21st against the run (120.4 yards per game). Peterson rushed 10 times for 16 yards and added a three-yard catch on his lone target in Sunday's 40-16 loss to the Giants. Peterson (shoulder) doesn't carry a designation into Sunday's game against the Giants, Tarik El-Bashir of The Athletic reports. Analysis: Despite making regular appearances on Washington's injury reports throughout the season, Peterson has emerged without a designation for nine of 12 prior gamedays. While the potential exists for the 33-year-old to aggravate his shoulder during a contest, he should carry the load Sunday against a Giants defense that has yielded 4.4 yards per carry and 16 total touchdowns to running backs in 12 outings. Peterson (shoulder) practiced in a limited fashion Thursday, Kareem Copeland of The Washington Post reports. Peterson (shoulder) was present at Thursday's practice, John Keim of ESPN.com reports. Analysis: After his typical veteran day off to manage a lingering shoulder injury, Peterson is back in the fold one day later. His level of participation is of some interest, but the fact he's practicing is enough to know the 33-year-old is trending toward a game appearance, per usual. Peterson (shoulder) didn't practice Wednesday, NFL.com reports. Peterson rushed nine times for 98 yards and a touchdown in Monday night's 28-13 loss to the Eagles. Peterson (shoulder) is listed as active Monday at Philadelphia. Updating a previous report, Peterson (shoulder) is listed as questionable for Monday's game against the Eagles, according to Tarik El-Bashir of The Athletic. Peterson (shoulder) doesn't have an injury designation on the Redskins' preliminary injury report for Monday's game at Philadelphia. Analysis: Peterson didn't practice Thursday but progressed to a limited participant Friday, though the Redskins have yet to release Saturday's practice report. The 33-year-old appears as though he should be a full-go for Monday's game against an Eagles team that has allowed a 100-yard rushing effort in each of the last three games. Passing-down specialist Chris Thompson (ribs) is primed for his return, which could put a slight dent in the veteran's snap share. Peterson (shoulder) returned to practice Friday as a limited participant. Peterson (shoulder) didn't practice Thursday, John Keim of ESPN.com reports. Peterson (shoulder) carried 12 times for 35 yards and caught two passes for nine more yards during Thursday's 31-23 loss to the Cowboys. Peterson (shoulder) was a full participant in Tuesday's practice, David Helman of the Cowboys' official site reports. Peterson (shoulder) was listed as a limited participant on Monday's estimated injury report, David Helman of the Cowboys' official site reports. Peterson (shoulder) rushed 16 times for 51 yards and two touchdowns while seeing no involvement in the passing game during Sunday's 23-21 loss to Houston. Peterson (shoulder) was a full participant in Thursday's practice. Peterson (shoulder) was a limited practice participant Wednesday, Kareem Copeland of The Washington Post reports. Peterson rushed for 68 yards on 19 carries and added one yard on two catches during Sunday's 16-3 win over the Buccaneers. Peterson (shoulder) was listed as a full participant in Thursday's practice, Greg Auman of The Athletic reports. Peterson (shoulder) was a limited participant at Wednesday's practice, Kareem Copeland of The Washington Post reports. Peterson will spend the rest of the year running behind an offensive line that just lost starting guards Brandon Scherff (pectoral) and Shawn Lauvao (knee) to season-ending injuries, Kareem Copeland of The Washington Post reports. Peterson ran for 17 yards on nine carries and added 16 yards on three catches during Sunday's 38-14 loss to Atlanta. Analysis: The outing snapped a three-game streak in which Peterson tallied at least 95 yards per game. The veteran back has had some monster games in D.C. this season but has been held to under two yards per carry in three of five games. Next up is a Tampa Bay defense that has been peppered in the passing game but is holding opponents to a respectable 4.2 yards per carry. Peterson (shoulder) was a full practice participant Friday and doesn't have an injury designation for Sunday's game against Atlanta, Kareem Copeland of The Washington Post reports. Analysis: There was never any concern about Peterson's availability, as the team has merely been cautious about limiting the 33-year-old's practice reps in recent weeks to keep him fresh for gamedays. Peterson could get a few extra snaps against a soft Atlanta defense in the absence of Chris Thompson (ribs) this week. Peterson (shoulder) was limited at Thursday's practice. Analysis: Peterson is following a similar path to last week, when he opened with a DNP on Wednesday only to be cleared on the final injury report. Assuming the same occurs this week, he may be working without Chris Thompson (ribs) for a third time in four games. When Thompson was held out Weeks 6 and 7, Peterson combined for 42 touches for 204 yards from scrimmage, but an end-zone visit eluded him. Peterson isn't participating in practice Wednesday, Les Carpenter of The Washington Post reports. Peterson (ankle/shoulder) carried 26 times for 149 yards and a touchdown during Sunday's 20-13 win over the Giants. He also caught one pass for seven yards and another score. Peterson (ankle/shoulder) doesn't have an injury designation for Sunday's game against the Giants, Kareem Copeland of The Washington Post reports. Analysis: Peterson upgraded to full participation at Friday's practice after logging limited sessions Wednesday and Thursday. He could lose a few snaps with Chris Thompson (rib/knee) appearing ready to return, but there's no reason to believe the 33-year-old won't be fine to handle his usual workload on the ground. The Giants were gouged by Alvin Kamara back in Week 4, but they've otherwise done a decent job holding running backs in check. Peterson (ankle/shoulder) was limited in Thursday's practice, Kareem Copeland of The Washington Post reports. Coach Jay Gruden said Peterson (ankle/shoulder) will regularly receive Wednesday practices off for the rest of the season, Kareem Copeland of The Washington Post reports. Peterson rushed 24 times for 99 yards and added eight more on his lone reception in Sunday's 20-17 defeat of the Cowboys. Analysis: Despite struggling with multiple injuries during the week, Peterson looked spry as ever, extending runs with both power and elusiveness throughout the game. The 33-year-old now has back-to-back contests with at least 97 rushing yards. He'll try to make it a third straight in Week 8 on the road against the Giants. Peterson (ankle/shoulder) is active for Sunday's game against the Cowboys. The Redskins are expected to make Peterson (ankle/shoulder) active for Sunday's game against the Cowboys, Dan Graziano of ESPN.com reports. Analysis: Though listed as questionable with a pair of injuries, Peterson was never believed to be in any serious danger of missing Sunday's contest after relaying Friday that he felt healthier than he did a week ago. His availability won't be officially confirmed until approximately 90 minutes before the 4:25 p.m. EDT kickoff, but fantasy owners who were intending on using Peterson this week can probably go through with those plans. Peterson (ankle/shoulder) is listed as questionable for Sunday's game against Dallas, but noted that he feels much better than he did at the same point last week, Kareem Copeland of The Washington Post reports. Analysis: Peterson doesn't seem to be in much danger of missing the contest, considering he played through the same pair of injuries last week while taking 17 carries for 97 yards in a 23-17 win over the Panthers. Fellow running back Chris Thompson (ribs/knee) is truly questionable, with the expectation that his status will come down to a game-time decision. Kapri Bibbs likely would take most of Thompson's vacated snaps in the event of an absence, but Peterson might also benefit from a bit of extra work. Peterson (ankle/shoulder) was a limited participant in Thursday's practice, Les Carpenter of The Washington Post reports. Peterson (ankle/shoulder) took part in individual drills during the portion of practice open to the media Thursday, John Keim of ESPN.com reports. Analysis: After taking off Wednesday to focus on treatment for an assortment of injuries, Peterson is destined to be called at least a limited participant Thursday. 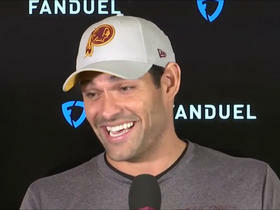 Look for his status to be clarified on the Redskins' second injury report of the week. Peterson (ankle/shoulder) didn't practice Wednesday, David Helman of the Cowboys' official site reports. 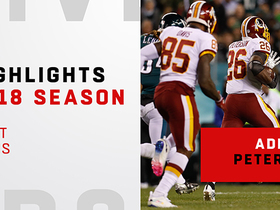 Analysis: Despite entering a Week 6 matchup against the Panthers with a number of injuries, Peterson took the field for 37 of the Redskins' 70 offensive snaps and compiled 17 carries for 97 yards. His absence Wednesday likely is precautionary, but his status bears monitoring as the week goes on to ensure he's trending toward an appearance Sunday versus the Cowboys. Peterson didn't take part in the part of Wednesday's practice open to the media, Kareem Copeland of The Washington Post reports. Analysis: Peterson tended to a trio of injuries last week, earning a limited tag on all three injury reports. He proceeded to play through issues related to his shoulder, ankle and knee during Sunday's 23-17 win against the Panthers, racking up 97 yards on 17 carries. Peterson likely will be listed with at least one of those concerns on Wednesday's injury report, but it remains to be seen if he'll be able to participate in some fashion. 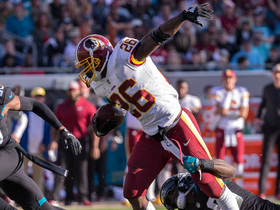 Peterson (shoulder) rushed 17 times for 97 yards and failed to come up with his only target in the Redskins' 23-17 win over the Panthers on Sunday. Peterson (shoulder) is listed as active Sunday against the Panthers. Analysis: With Chris Thompson (ribs/ankle) out of commission, Peterson shouldn't have any problem handling the majority of touches out of the Redskins backfield. Peterson will be working through a hyperextended knee and strained shoulder, though, which likely will hinder his potential to produce, especially versus Carolina's eighth-ranked run defense (95.0 yards allowed per game). Despite being listed as questionable, Peterson (shoulder/ankle/knee) should be able to start and handle his usual workload Sunday against the Panthers, according to Rich Tandler of NBC Sports Washington. Peterson (shoulder/ankle/knee) is listed as questionable and expected to be a game-time decision Sunday against the Panthers, John Keim of ESPN.com reports. Peterson (shoulder/ankle/knee) was a limited participant in Thursday's practice, Kareem Copeland of The Washington Post reports. Peterson (shoulder/ankle/knee) was limited at Wednesday's walk-through practice. Analysis: Peterson is dealing with an array of injuries at the moment. The ankle issue likely stems from the sprain he picked up in Week 3, but the shoulder injury looks to be his chief concern. After Monday's loss to the Saints, Peterson required an MRI for the shoulder, with doctors diagnosing him with a strain. While he doesn't expect to miss any game action due to the shoulder or the other two injuries, there's a chance his snap count could be impacted Sunday versus the Panthers and beyond. Peterson was diagnosed Tuesday with a strained shoulder, Tom Pelissero of NFL.com reports. The running back isn't expected to miss game action due to the issue, but he'll receive a second opinion on the injury. Peterson is scheduled to undergo an MRI on Tuesday after he sustained a shoulder injury in Monday's 43-19 loss to the Saints, John Keim of ESPN.com reports. Peterson told reporters he dislocated his shoulder during the first half of Monday's loss to the Saints, JP Finlay of NBC Sports reports. Analysis: Peterson said that he popped the shoulder back in and returned to the field, so it doesn't seem like the injury is too severe. However, it will be something to keep an eye on when the Redskins' practice report is released later this week. The veteran was limited in the second half, ending the night with four rushes for six yards and two receptions for 36 yards. Peterson rushed four times for six yards and caught two of three targets for 36 yards in Monday night's 43-19 loss to the Saints. Peterson (ankle) logged a full practice Saturday, Kareem Copeland of The Washington Post reports. Analysis: Peterson was able to practice in a limited fashion Thursday and Friday, and now looks on track to play after having a bye week to recover from a sprained ankle suffered in Week 3. Barring a setback, Peterson will have a matchup against a Saints defense that is currently the stingiest in the league against the run, as it has given up only 3.2 yards per carry through four weeks. Peterson (ankle) was a limited practice participant Friday and appears to be on track to play Monday in New Orleans, Rich Tandler of NBC Sports Washington reports. Analysis: Despite being listed as limited for a second straight day, Peterson appeared to move through drills without any hesitation, per Tandler. His status will still be worth monitoring when the Redskins release their final injury report Saturday. Peterson (ankle) was a limited practice participant Thursday, John Keim of ESPN.com reports. Analysis: Since spraining his ankle Week 3, Peterson rehabbed throughout the Redskins' Week 4 bye and emerged with a limited showing in the first practice of Week 5 prep. It wouldn't surprise if the team exercises caution with its starting running back, with Saturday's injury report giving his chances of suiting up Monday at New Orleans. Peterson (ankle) participated in practice Thursday, JP Finlay of NBC Sports Washington reports. Analysis: After spraining his ankle Week 3, Peterson has benefited from the Redskins early bye Week 4 and a Monday night affair Week 5 in the team's return to action, giving him plenty of time to rest and rehab. It's unclear how much work he'll fit in, but his activity level will be confirmed upon the release of Thursday's injury report. Peterson (ankle) said he will be ready to play in Monday's game against the Saints, John Keim of ESPN.com reports. Analysis: Peterson's optimism need to be taken with a grain of salt, especially after he was held out of Wednesday's practice, per Keim. He was spotted in a protective boot last week, getting some extra time to recover with the Redskins on bye. Peterson may be able to resume practicing Thursday when the team releases its first injury report of the week. Peterson (ankle) is working on a side field with the training staff at Monday's practice, JP Finlay of NBC Sports Washington reports. Analysis: Peterson sprained his ankle in a Week 3 win over the Packers and was spotted wearing a protective boot last Monday. He's no longer wearing the boot after a bye week, but he apparently isn't quite ready to practice with his teammates. The Redskins won't release an official injury report until Thursday, ahead of a Monday Night Football matchup with the Saints in Week 5. The backfield will be manned by Chris Thompson, Samaje Perine and Kapri Bibbs if Peterson ultimately isn't available. Peterson sprained an ankle during Sunday's 31-17 win over Green Bay, but he's expected to be ready when the Redskins return from their bye week for a Week 5 game in New Orleans. Peterson rushed 19 times for 120 yards and two touchdowns in the Redskins' 31-17 win over the Packers on Sunday. Peterson rushed 11 times for 20 yards and caught all three of his targets for 30 more in Sunday's 21-9 loss to the Colts. Peterson took 26 carries for 96 yards and a touchdown and caught two of three targets for 70 yards in Sunday's 24-6 win over the Cardinals. Peterson has been confirmed as the Redskins' starting running back for Sunday's season opener against the Cardinals, John Keim of ESPN.com reports. Redskins head coach Jay Gruden jokingly said he would like to give Peterson 40 carries in Sunday's season opener against the Cardinals, JP Finlay of NBC Sports Washington reports. Analysis: Though obviously not serious about the number of carries, Gruden is providing another strong hint that Peterson will be the featured ballcarrier in Week 1. 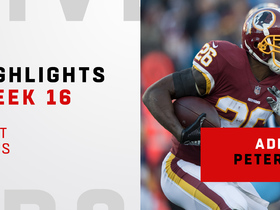 The 33-year-old holds the top spot on Washington's initial regular-season depth chart, with passing-down specialist Chris Thompson listed as the No. 2 back. It's entirely possible Rob Kelley and Samaje Perine open the season with minimal or non-existent roles on offense. Peterson has secured a roster spot and is primed for a key role on first and second downs, ESPN.com's John Keim reports. Analysis: Peterson was held out of Thursday's preseason finale in Baltimore after taking 11 carries for 56 yards the previous week against the Broncos. He didn't need much time to climb past Rob Kelley and Samaje Perine on the depth chart, and it's now possible one of the two will be released before Week 1. Chris Thompson (leg) will still have a key role on passing downs, but Peterson is the favorite to start and get most of the carries in Washington's season opener at Arizona on Sept. 9. Peterson took 11 carries for 56 yards in the first half of Friday's preseason game against the Broncos. Coach Jay Gruden wants Peterson to get a handful of carries with the first-team offense in Friday's preseason game against Denver, ESPN.com's John Keim reports. 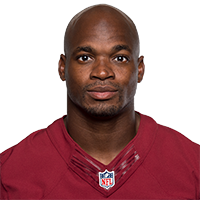 Peterson isn't guaranteed a spot on the Redskins' 53-man roster, Rich Tandler of NBC Sports Washington reports. Analysis: Peterson joined Washington on a one-year, $1.015 million contract earlier in the week, which represents the veteran's minimum for a player with his tenure. He has less than two weeks to make an impression before roster cutdown day, with the goal of convincing the Redskins he can provide an upgrade on Rob Kelley and/or Samaje Perine (ankle). Head coach Jay Gruden expects Peterson to get a few touches in Friday's preseason game against the Broncos. Coach Jay Gruden confirmed Peterson will receive "a few touches" in Friday's preseason game against the Broncos, JP Finlay of NBC Sports Washington reports. Analysis: It'll be interesting to see if Peterson immediately mixes in with the first-team offense, and with Chris Thompson (leg) likely sitting again and Samaje Perine dealing with a sprained ankle, the newcomer could be the first running back off the bench behind Rob Kelley. Peterson posted a dismal 3.4 YPC between the Saints and Cardinals last season before suffering a season-ending neck injury, but the 33-year-old nonetheless is getting another chance to continue his vaunted NFL career. Peterson is signing with Washington, Mike Garafolo of NFL Network reports. Peterson will meet with the Redskins on Monday, John Keim of ESPN.com reports. Peterson (neck), who will be released by the Cardinals on Monday, said he received a clean bill of health and intends to continue his career, Josina Anderson of ESPN reports. Analysis: Peterson missed all of December due to a neck injury, finishing with 129 carries for 448 yards (3.5 average), two touchdowns and three fumbles (two lost) in six games for the Cardinals. He'll turn 33 next week and may have to settle for a committee role, having played more than 10 games in a season just once since 2013. Peterson likely will look for a new home, as David Johnson (hand) figures to gobble up the vast majority of backfield snaps in Arizona. The Cardinals are releasing Peterson (neck) on Monday, but they might consider re-signing him on a smaller contract, Adam Schefter of ESPN reports. The Cardinals are expected to release Peterson (neck) in the offseason, Mike Jurecki of Arizona Sports 98.7 FM reports. Peterson (neck) will be placed on injured reserve, Adam Schefter of ESPN reports. Analysis: Peterson hasn't had any reps in practice since injuring his neck against the Jaguars in Week 12. His season is now over. Kerwyn Williams will continue to receive a large workload in the backfield as a result, with D.J. Foster and Elijhaa Penny also getting some touches. Peterson will undergo weekly scans on his neck, which will guide the Cardinals' decision-making process with the veteran running back, Josina Anderson of ESPN reports. Cardinals head coach Bruce Arians said Wednesday that he has "no idea" if Peterson (neck) would be able to play in any of the Cardinals' final three regular-season contests, Kyle Odegard of the Cardinals' official site reports. Head coach Bruce Arians said Friday that there's no time line for Peterson's (neck) return, Darren Urban of the Cardinals' official site reports. Analysis: The Cardinals, namely Arians, have been coy about the nature of Peterson's injury, which he sustained Week 12 in the latter stages of a win against the Jaguars. Until Peterson makes his presence felt at practice, the backfield will be the domain of Kerwynn Williams, who racked up 16 carries for 97 yards this past Sunday against the Rams. Behind Williams, D.J. Foster can expect some reps, primarily in passing situations, while the bigger-bodied Elijhaa Penny gets work in short-yardage situations. Peterson (neck) has been ruled out for Sunday's game versus the Titans, Josh Weinfuss of ESPN.com reports. Analysis: In Week 12 against the Jaguars, Peterson injured his neck late in the fourth quarter when he was driven into the turf. He hasn't practiced in the interim, setting up Kerwynn Williams to lead the backfield for a second consecutive game. That said, D.J. Foster will be available in a change-of-pace role while Elijhaa Penny could handle goal-line reps yet again. Peterson (neck) is considered unlikely to play Sunday against the Titans, Josina Anderson of ESPN reports. Analysis: Peterson didn't practice the last two days after sitting out all of last week, so signs are clearly pointing toward him missing a second straight game. While it's not believed that Peterson will require any sort of procedure on his neck, he may need ample time to rest up and heal. The Cardinals will reveal Peterson's official status for Week 14 following Friday's practice, and if he's indeed ruled out, Kerwynn Williams would be on track to work as the Cardinals' top running back Sunday. Peterson (neck) was held out of Thursday's practice, Josh Weinfuss of ESPN.com reports. Arizona head coach Bruce Arians said Peterson (neck) won't practice Wednesday and the running back's status for Sunday's game against Tennessee remains undetermined, Jim Wyatt of the Titans' official site reports. "We'll wait and see," Arians said, regarding Peterson's Week 14 availability. "We're still waiting on the doctors to clear him." Cardinals head coach Bruce Arians said Monday that he isn't sure if Peterson (neck) will be back for Sunday's game against the Titans, Josh Weinfuss of ESPN.com reports. Peterson (hand) is inactive for Sunday's game against the Rams, Adam Schefter of ESPN reports. Analysis: Kerwynn Williams will likely handle the bulk of the touches out of the backfield, though D.J. Foster and Elijhaa Penny could also factor into the mix. Peterson (neck) is listed as questionable for Sunday's game against the Rams, despite being listed as a non-participant for every practice this week, Darren Urban of the Cardinals' official site reports. Peterson (neck) isn't present for the portion of Friday's practice open to the media, Josh Weinfuss of ESPN.com reports. Offensive coordinator Harold Goodwin said Thursday that he expects Peterson (neck) to be available Sunday against the Rams, Darren Urban of the Cardinals' official site reports. Peterson didn't practice Wednesday due to a neck injury, Kyle Odegard of the Cardinals' official site reports. Peterson had 20 carries for 79 yards and four catches for 20 yards on five targets in Sunday's 27-24 win over the Jaguars. Peterson rushed for 26 yards on 14 carries and added a 13-yard catch during Sunday's 31-21 loss to Houston. Analysis: The veteran back has had two monster performances since joining the Cardinals, gashing both the Buccaneers and 49ers. He's averaged just 1.65 yards per carry in his other three games with Arizona. True, those games were against tough defenses in the Rams, Seahawks, and Texans. The bad news is, however, things won't be getting much better soon with dates against the Jaguars and Rams next on the schedule. Peterson rushed 21 times for 29 yards and brought one of two targets for 13 yards in Thursday's 22-16 loss to the Seahawks. He was also tackled for a safety and lost a fumble. Peterson rushed 37 times for 159 yards and brought in two of four targets for eight yards in Sunday's 20-10 win over the 49ers. He also lost a fumble. Cardinals offensive coordinator Harold Goodwin suggested that he wants to give Peterson a lot of carries during Sunday's game in San Francisco, Kyle Odegard of the Cardinals' official website reports. "Feed the beast," Goodwin said. "It's like an old stove. The more wood you put in it, the hotter it gets. We've just got to make sure we feed him the ball so he can get comfortable." 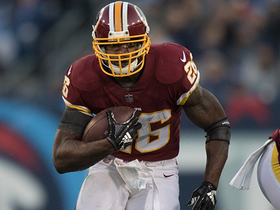 NFL Network's Tom Pelissero reports that the Washington Redskins would like to have running back Adrian Peterson back in 2019. 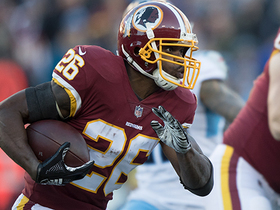 Watch the best runs from Washington Redskins running back Adrian Peterson in his 2018 season. 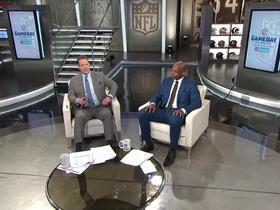 NFL Network's Chris Rose sits down with Washington Redskins running back Adrian Peterson to discuss what keeps him motivated to keep playing in the NFL. 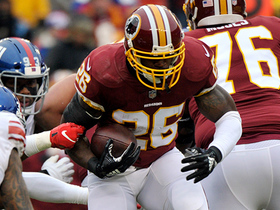 Washington Redskins running back Adrian Peterson runs for over 100 yards in a 25-16 loss to the Tennessee Titans in Week 16 of NFL action. 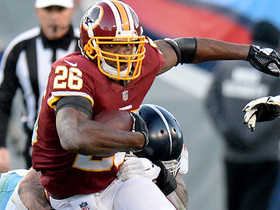 Washington Redskins running back Adrian Peterson rushes for 7 yards. 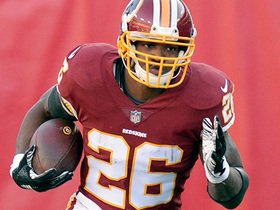 Washington Redskins running back Adrian Peterson spins, fights way to a first down.